Masked Arab rioters clash with security forces in several neighborhoods in eastern Jerusalem. 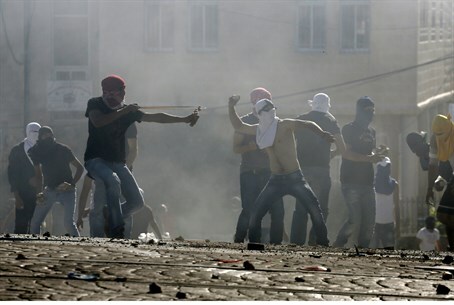 Clashes broke out Friday night between masked Arabs and security forces in eastern Jerusalem. The clashes took place in the neighborhoods of Shuafat, Isawiyya, Wadi Joz, Abu-Tor and Umm Tuba. During the clashes in Shuafat, the rioters tried to damage an electricity pole using an electric disc. The forces are using riot dispersal means to fend off the Arab rioters. In a separate incident in Ma’aleh Adumim, Palestinian Arabs threw rocks and firebombs towards security forces. Arabs have been rioting in the Jerusalem area for three days, after the murder of 16-year-old Mohammed Abu-Khder, whose body was found in the Jerusalem Forest on Wednesday morning. Rumors have circulated that the teen's murder was an act of Jewish "revenge" over the abduction and murder of three Israeli teens Naftali Frenkel (16), Gilad Sha'ar (16) and Eyal Yifrah (19). However, several reports indicate the abduction was in fact carried out by Arabs as an "honor killing" or another kind of criminal murder. There have been conflicting testimonies from the boy's own parents about an alleged abduction reported the night before the murder, in which his mother said the assailants were Jews, while the father insisted they were Arabs. On Wednesday and Thursday, rioters threw pipe bombs, firebombs, and rocks at Israeli forces and the press and shouted anti-Semitic chants; three Jerusalem Light Rail stations were burnt down as well.